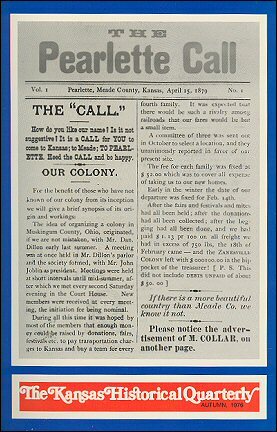 With the coming of the Zanesville (Ohio) colony to establish the town of Pearlette in Meade county, Kansas, early in 1879, came the type and press for publication of its newspaper, the Pearlette Call, first issued in April 16, 1870. The first page of the minipaper is reproduced on the cover, and the remaining 11 pages of the 12-page issue appear between pp. 272-273.